Provide comfort for the family of Marsha Maxwell with a meaningful gesture of sympathy. Marsha Diane Maxwell, 56, of Independence, MO, passed to her heavenly home Monday, February 4, 2019. A visitation will be held on Thursday, February 7, 2019 from 1-2 pm, with a service to follow at 2 pm, both at Speaks Suburban Chapel 18020 E 39th St, Independence, MO 64055. Burial will be a Floral Hills Cemetery following the service. Marsha was born May 26, 1962 in Independence, MO to Rex and Betty (Meneely) Maxwell. 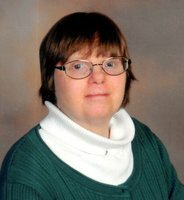 Marsha was in special education and graduated from William Chrisman High School. She was a life-long member of Sycamore Hills Baptist Church where she enjoyed attending every Sunday. She loved singing hymns and all church music. Marsha was loving and known for hugging her friends. She was a happy girl and a friend to anyone she met. Marsha is survived by her mother, Betty Maxwell; sisters, Marilyn Payne and Julie Braby; and her nieces and nephews. She is preceded in death by her father, Rex Maxwell. In lieu of flowers, the family requests donations be made to the Sycamore Hills Baptist Church Building Fund 15200 East 39th Street Independence, MO 64055. To send flowers in memory of Marsha Diane Maxwell, please visit our Heartfelt Sympathies Store. Consider providing a gift of comfort for the family of Marsha Maxwell by sending flowers. We encourage you to share your most beloved memories of Marsha here, so that the family and other loved ones can always see it. You can upload cherished photographs, or share your favorite stories, and can even comment on those shared by others. Provide comfort for the family of Marsha Diane Maxwell by sending flowers.